Thos. Moser Cabinetmakers has set the standard for fine woodworking and meticulously hand-crafted furniture for more than forty years. In this modern age of inexpensive mass production, Moser furniture stands out because every piece is hand-made by a master craftsman (or woman). Generally minimalist in style, the pieces are highly sophisticated in their construction. And though Moser has been influenced by Shaker and Japanese furniture makers, the elegant and graceful lines give each piece an aesthetic all its own. In Legacy in Wood, Thomas Moser reflects on his long career and offers his thoughts on creativity, inspiration, and his design aesthetic. It gives an intimate look into the life and work of a pioneering craftsman, whose example shows that you can build a career working with your hands the old-fashioned way. Thomas Moser is president and founder of Thos. Moser Cabinetmakers in Auburn, Maine. A former English professor and antiques restorer, he opened his workshop in 1972. He has written several books about building fine furniture. He lives in New Gloucester, Maine. Donna McNeil is the Co-Director of Artists in Context and the former Executive Director of the Maine Arts Commission. She has served as a juror for the National Endowment for the Arts and MacArthur Foundation. She holds a BFA in Painting from Syracuse University, an MLA in Art History from Harvard University, and an honorary Doctorate in Fine Arts from the Maine College of Art. She lives in Portland, Maine. The timeless appeal of the furniture has given Moser nationwide recognition and allowed the company to open galleries and show rooms across the US. MOSER Legacy in Wood is beautifully photographed and would appeal to experts as well as anyone interested in well-crafted furniture. 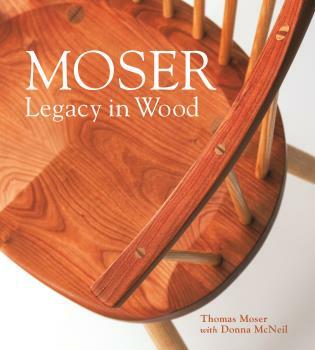 "The book, Moser: Legacy in Wood, provides a very personal history of the company’s development, the inspiration and evolving nature of its designs and the meticulous process used in selecting woods and crafting. Photographs throughout provide sumptuous close-ups of details and furniture set off in room settings, as well as craftsmen at work. It is a book that would be much appreciated by the fine furniture lover, whether armchair, collector or builder." Thos. Moser remains an iconic Maine company and holds to its traditional Yankee origins. The shop remains a family-run and oriented company. All of Moser’s sons have worked in the shop, and all but one are still there as master craftsmen and designers. The other employees have been with the company an average of 20 years—a clear reflection of the value Moser puts on his workers and the respect and love for their work they give in return. Yet the timeless appeal of the furniture has given Moser nationwide recognition and allowed the company to open galleries and show rooms in Boston, Greenwich, New York, Philadelphia, and San Francisco.